DAN in Chinese means pill for a cure, usually given by an immortal or devised by a famous medicine man in Chinese folklore. BINTANGOR ROJAK: Famous Bintangor rojak sold by a Chinese stall at the Muslim Food Open Market. Ming Dan means bright pill. Did anyone find out why Sarawakian Foochows called Bintangor Ming Dan? According to an old story, the Malays called this little town Kampung Binatang Makan Engkabang because during the engkabang season, a lot of animals came out to eat the fruits that dropped from the engkabang trees along the bank of the Rajang. There was probably a Malay kampung situated nearby. Jamu is a Malay word for Dan or pill. Binatang, as a name, was acceptable to the Foochows who came to settle here in 1920. Furthermore, its Chinese name is very meaningful – bright and lovely medicinal pill. Known as Bintangor today, the former Binatang is the capital of Meradong District in Sarikei Division and situated along the lower reaches of the Mighty Rejang. It’s still one of those small Sarawak agro-towns “easily overlooked or bypassed” such as Roban, Engkili and Marudi, to name a few. 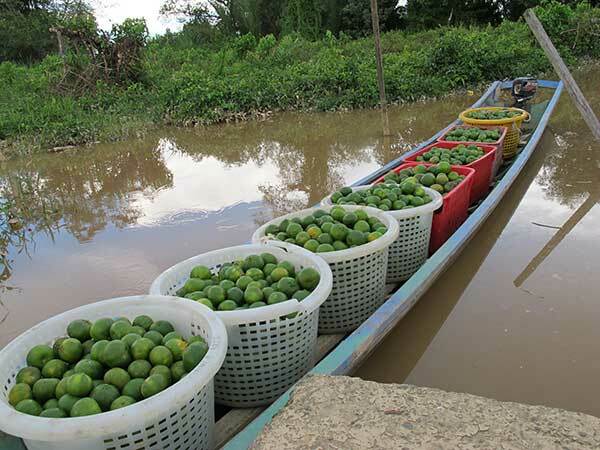 GREEN AND SWEET: Bintangor oranges ferried across the river by a longboat. If a family drives from Sibu to Kuching, it will rather stop at Jakar, adjacent to the trunk road, than drive into Bintangor. The government had tried its best in past few decades to encourage growth — for example through the Rajang Institute of Teacher Education, the large Meradong Government Secon-dary School and a proposed university. Some shoplots were built over the years but have been just adequate for the population increase. A few new bridges — the Nyelong Bridge and the Red Bridge — were built not too long ago, making Bintangor accessible to Sibu and Sarikei. Ferries were a boon to the people of Bintangor in the past 20 years but still they were not adequate to pull both people and business into the small town. However, interestingly, there are many things to learn about Bintangor on a day trip. And it indeed may prove more re-warding than you ever expect. It takes 35 minutes to drive from Sibu to Bintangor. The toll is RM3 each way at Lanang Bridge, Sibu. Ming Dan was founded in 1920 by three Foochows — Tiong Kung Ping, Ling Ming Lok and Rev Yao Siew King (all hardly 30 years old) — with the encouragement and help of Rev James Hoover of the Methodist Mission. Armed with a letter of authority from the Rajah, they opened up a large tract of agricultural land at the confluence of Meradong and Rejang Rivers for 300 Foochow families. This venture proved a little difficult at first but the pioneers pressed on and managed to set up the first Methodist Church — Kai Nguong Church — for the Christian pioneers. A primary school followed in 1921 for the pioneering families and their children. Tiong Kung Ping also established the first rice mill (Mee Ang Rice Mill) in Bintangor — source: Sarawak Chinese Methodist Church 50th Anniversary Report. According to one historian, the Malays settled in Bina-tang/Bintangor earlier than the Foochows circa 1896 and had moved away but they were requested by Rajah Brooke to re-establish their kampung below Binatang some time in 1920-1 to help provide security for the new comers against the other natives. Perhaps this is why the Malay Kampung of Bintangor, which is still there, is “below” the town. It was said VIPs and leading government officers became uneasy when they were introduced during functions — example: Encik Sulaiman, DO Binatang, Encik Albert Wong, DMO Binatang, Encik David Bong, DEO Binatang which translate into Encik Sulaiman, Animal District Officer and Encik Albert Wong, Animal Divisional Medical Officer … (Note: all the names are not real). Hence, to discontinue the jokes and uneasiness, a campaign was mounted to change the name of the town. In 1984, the Sarawak government instructed that the name Binatang District be changed to avoid sensitivity pertaining to the name of the place. One can still imagine the busy days at the riverside in the 1950’s and 1960’s. Horns tooting, engines kicked into life and wharf labourers shouting out warnings. The old and young, male and female, all trying to get into or out of the motor launches and expressboats, hurrying to and fro before the day was done. OLD BUDDIES: Two good friends in a boat – Abdillah (left) lending a hand to Mr Ling who is related to pioneer Ling Ching Tu. In the earlier days, the towkays of Binatang (from 1921 to 1980) owned slow wooden noisy diesel-operated motor launches and later “bullet or spaceship” like expressboats plying between Binatang and Sibu. These boats carried both passengers and bales of rubber sheets, baskets of fresh fruits and other agricultural products from the town and its hinterland and on the return journey, brought canned food, beer, bottled drinks and other sundry goods. This enabled Binatang to grow slowly from a one-street town to a bustling one. Delightful Malay kampungs with their distinct designs also grew in numbers and further inland, Iban long-houses, fronted by large tracts of padi fields, also sprang up from the 1930’s onwards with the establishment of government offices and medical clinics. Other smaller villages were connected to the town by smaller boats or canoes. Thus, waterways formed life links in the area. By the 1980’s, roads connecting the towns of Sarawak were completed and the motor launches and expressboats became obsolete. Riverine life quietened, if not coming to a standstill. Longboats with Mercury outboard engines were occasionally tied at the now quiet wharves in Bintangor. The steel ramps and wooden fences where once local touts were eager to help lift loads for daily wages, were empty. The old style of riverine living can now only be found in history books or personal photo albums. Bintangor oranges are sweet, thin-skinned citrus fruits. Debates have long been held as to how these green citrus fruits came to Sarawak. Were they first brought in by the Hakkas? Did the enterprising Foochows bring in the first seedlings and start growing them on hundreds of acres in Ming Dan? Today, strong, lanky sixty-plus Mr Ling owns 10 acres across the river where he grows Bintangor oranges. He continues to be a leading businessman in town. Each evening, he would use his small wooden longboat to bring his freshly plucked oranges to Bintangor where Abdillah, his long time friend, would help him carry the baskets up to a waiting trolley. “Don’t think he is a poor farmer. He actually owns several businesses,” Abdillah remarked. This is really a good description of the typical hard-working Foo-chow man who does not flaunt his wealth. In fact, many years ago, these Bintangor oranges helped su-pport a factory, producing the Green Mountain brand of orange drinks. It was popular until Zappel, Sunkist, Seven Up and Coca Cola flooded the market. The Foochows have been enterprising in many parts of the world — in particular Malaysia. They came to Sarawak with nothing. But they brought along three knives – one of them was a pair of scissors. Binatang started with one tailor shop and later more were set up by other dialectic groups. Hence, it was not surprising the Singer Sewing Machine was hugely popular here — and remains so till today. Many parents would buy a ‘Singer’ as part of the dowry for their beloved daughters. In the past, sewing was a very important living skill for young Foochow women. Today, Tsang Toi (not a Foochow) with his scissors is a leading Chinese Malaysian designer in New York! Another important “knife” brought by the Foochows was the razor. Today, there are many second or third generation bar-bers in Bintangor. Enter a small barber shop in Bintangor and you are bound to see two barber chairs and one or two Foochow barbers. Most traditional Foochow barbers like to operate a single business, providing services like ear cleaning, clean shaving, crew cut, student cut, fashionable cut, and warm towelling. But very few will do hair wash, hair colouring or head massage. According to the China Daily (USA), a very famous son of China is Li Dongtian, hairstylist and entrepreneur extraordinaire, barely 40 years old. When Li Dongtian started learning how to cut hair in 1988, his dream was to become China’s Vidal Sassoon. He dreamed big dreams which were realised. The junior high school graduate is now the chairman of Dongtian Fashion Culture Broadcasting Co, which includes about 30 hair salons, stylist training schools, a stylist agency, cafes and gyms. Nearer home, Kevin Lau, whose maternal grandfather was a first cousin of Tiong Kung Ping, is a famous Foochow hairstylist and principal of Kevin Hairdressing Academy in Miri. Finally, no one will be disappointed visiting Bintangor if they love food, especially Chinese cuisine. 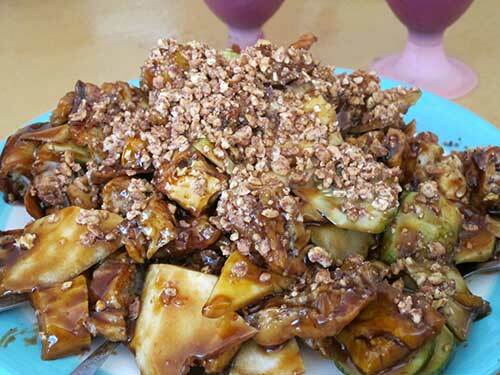 Bintangor offers some delectable Foochow dishes like the famous Foochow char mien, mang chiew kor (sweet cake), sweet and sour pork, imitation sharks fins, Foochow curry chicken, and mixed vegetables. The third knife brought by the Foochows is the Chef’s Knife. Indeed, many restaurants and coffeeshops of Bintangor have been run by the Foochows since 1920’s. Just one day in Bintangor filled with tales of the old days, you would go home feeling enriched and perhaps also hope to get your children skilled in using the three knives. If they are already adept at using them, you will probably have a nice smile and a strong happy heart all the days of your life. Previous ArticleA $6 mln question: Which part of Sarawak belongs to Misuari?